Essence Carson was sitting in her office at Capitol Records, taking a moment out of her day as a manager at Priority Records, a hip-hop label owned by Capitol Records in Los Angeles. 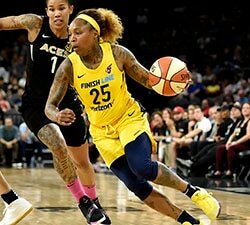 “I look at this as investing in myself,” said the Los Angeles Sparks forward, one of a collection of WNBA players who took a pass on playing overseas to pursue career options off the court. It is an option that seems to be open to more players in recent years. 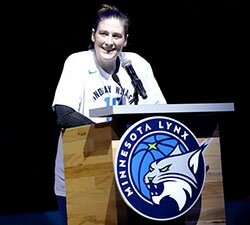 In the fall of 2017, Carson began an internship at Capitol as part of the WNBA Players Association internship program. When it was over, the label offered her a full-time job. 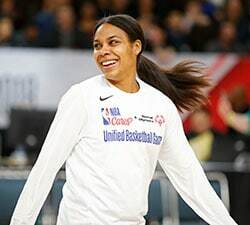 Carson worked full-time for the record label during the 2018 WNBA season, juggling it with her commitment to the Sparks. People don’t want to say “break a leg” to Renee Montgomery. Montgomery said has always wanted to act. In high school, instead of auditioning for drama productions, she played basketball every day. Montgomery, who bought a home in Atlanta eight years ago, said hardly anyone knew. Montgomery said her classes quickly led to some auditions and then she started getting parts. She is appearing in a holiday film on Amazon Prime called Not My Favorite Christmas, debuting on Dec. 20, and an independent film called Penny, Piper & Fianna. Montgomery said she wants to reach out to LeBron James’ production company to see if she might be able to get involved in any of his projects. And she wants to “set [herself] up” for a future career as an actress. Clarendon had just returned from Atlanta, where she sat on a panel for Turner Sports, a corporate event focusing on inclusion. She sat on the panel with NBA legend Charles Barkley and Hudson Taylor of Athlete Ally. “It was a great opportunity,” said Clarendon. The kind she wants more of. 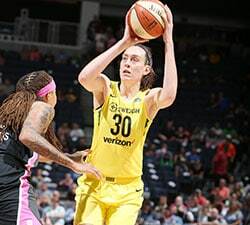 The Connecticut Sun guard is building her career as a speaker, “educating people and connecting with people about gender non-conforming issues. On top of that, she is doing broadcast work for the Pac-12 Network, providing color analysis on 14 women’s basketball games this season. Clarendon made a decision two years ago that she did not want to play overseas, that she wanted the time and space to work on her game — and her next career. Married last year, Clarendon and wife Jessica bought their first home in Oakland over the summer. Clarendon jokes that sometimes she questions her path when she sees a teammate pull up to the gym in a brand new luxury car. Carson, for one, said she feels lucky that she is able to pursue both of her passions. “I can’t live without either of them,” Carson said. “How many athletes have no idea what they want to do when they are done playing and they aren’t happy?